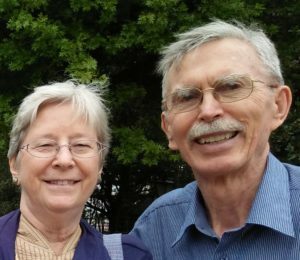 David and Judy had served in SE Asia for decades and in 2018 transitioned back to North Carolina. Begin CHBC group to reach out to Muslims. Promote involvement in missions in our home church (CHBC), and assist visiting missionaries. Help mentor potential candidates for cross-cultural work. God’s guidance to Durham/Chapel Hill neighborhood where we should live, and His enabling us to get settled well and to be a blessing to our neighbors. May we and other Bible Churchers form effective outreach effort to Muslims in the Chapel Hill/Durham region. Spend quality time with our sons Jonas (Charlottesville, VA) and Joel & his family (Lima, OH). If you’d like to get regular updates from David and Judy, contact us David at firstjohn4_19@fastmail.com.